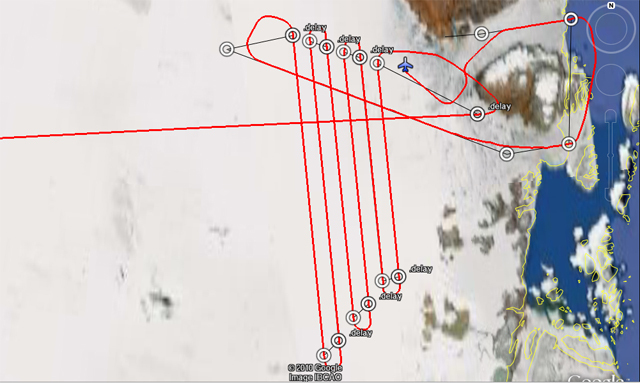 The actual flight path, including two extra flight lines down the middle of the glaciers. I am the GPS processor for the Land, Vegetation, and Ice Sensor (LVIS) team, along with Michelle Hofton. After arriving in Thule, Greenland, Michelle showed me the GPS Shack, which is where I will be working during the IceBridge mission. That’s where the ground-based GPS antennas and receivers for both the airborne LVIS and Airborne Topographic Mapper (ATM) instruments are located. “The Shack,” as we call it, happens to be on the opposite side of the base from rest of the buildings. It is very small — just big enough for a couple computers, receivers, and some chairs. Just outside the Shack is the pier in the North Star Sea. There is also a great view of Dundas Mountain, which we may be able to climb if it gets warm enough while we are here. While at the Shack, both the ATM GPS person and I check on the height of our antennas as well as replace data cards and download the GPS data from our receivers. The winds always seems to pick up once we get to the Shack since we are right on the frozen water, so measuring the height of the antenna can be rather difficult. As you can see in the picture we have several rocks weighing the antenna’s tripod down so it does not blow over. Over the years and several trials later, the LVIS group has, I believe, come up with the best standing position for our tripod set up, so the wind doesn’t blow it over and so it doesn’t sink into the ground too much. The antenna is checked and the data is downloaded about twice a day, usually before and after a flight. But we also leave the receivers running on days we don’t fly to collect as much data as possible. This allows us to get the best position possible for the antenna, which in turns gives us an accurate position when we combine it with the flight GPS data. Once the GPS data is collected, then the processing fun begins. Collecting data is a daily job for the GPS ground crew, and at the end of a mission, boy do we have a lot of data to process! 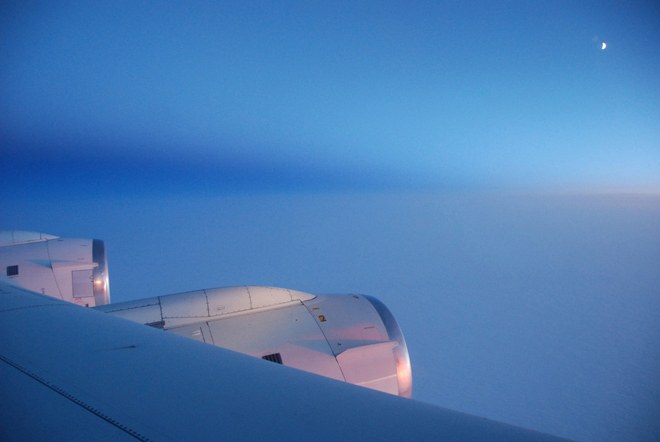 Before the IceBridge crew flew to Thule, Greenland, they performed a test flight on March 17 in California to calibrate the aircraft’s science instruments. From: John Sonntag, senior scientist with the IceBridge management team, URS Corporation in Wallops Island, Va. 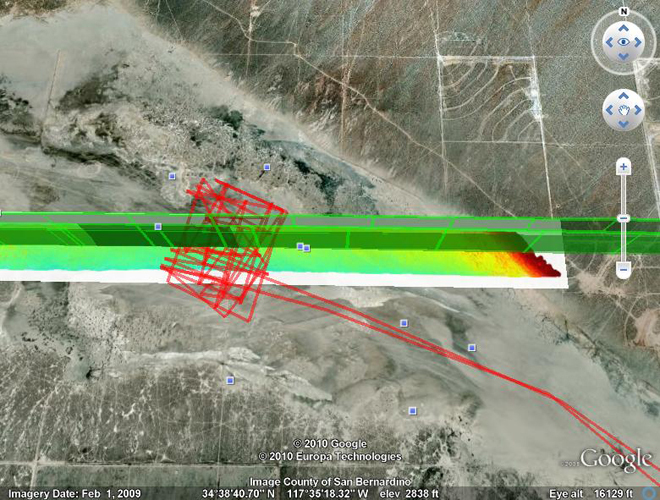 This Google Earth image graphically illustrates one of the many techniques the Airborne Topographic Mapper (ATM) team utilizes to calibrate and validate our instrument. The image shows El Mirage Dry Lake, about 25 miles east of Palmdale, Calif. We overflew the lakebed three times on the March 17 test flight — the flight paths are shown in green. The extremely detailed elevation measurements made by the ATM are depicted by the multi-colored swath, with warm colors depicting topographic “highs” and cool colors depicting lows. The red path is a survey we conducted of the lake surface with a GPS-equipped vehicle. By comparing the ATM laser swath measurements with the surface measurements we made using the GPS-equipped vehicle, we can derive a variety of calibration measurements for the ATM, which we use to improve its accuracy and precision, ultimately to the level of a few centimeters. This process has just begun and will be supplemented by many other datasets as we proceed with the campaign. Another aspect this image illustrates is the extremely high precision of our navigation systems, which are also part of the ATM system. The flight crew “coupled” their autopilot to our precise navigation system for all three of these passes. The result was that all three passes were within just a few meters of each other — pretty impressive when we’re flying at 250 knots! Hello, and welcome to the start of the Operation IceBridge Greenland 2010 campaign. Over the next few months we will be blogging about the science, research, aircraft, and day to day activities of our airborne campaign. The NASA DC-8 aircraft is fully loaded in Palmdale, Calif., and will take off late Sunday night to fly scientists, crew and instruments to Thule, Greenland. The DC-8 will stay in Greenland until the end of April at which time the NASA P-3B aircraft will take over for another month of flights monitoring the changes occurring over the Greenland ice sheet and the Arctic sea ice. Hopefully some of you are returning to the blog after our previous Greenland 2009 and Antarctic 2009 campaigns. Please check in often to follow our progress and learn more about our exciting Arctic research. 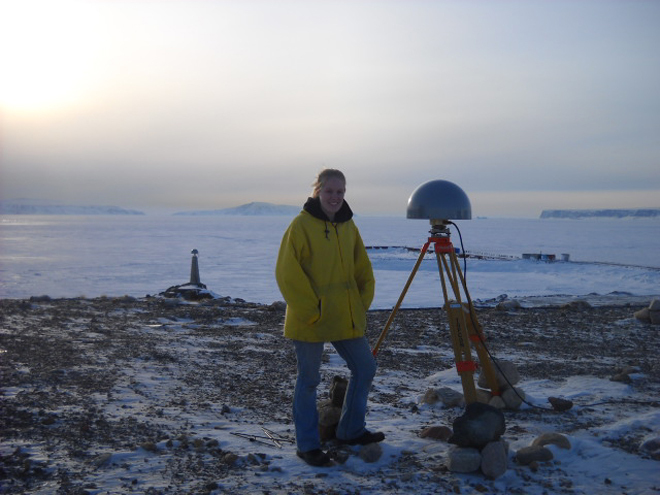 My name is Lora Koenig and I am a physical scientist in the Cryospheric Sciences Branch at NASA’s Goddard Space Flight center. 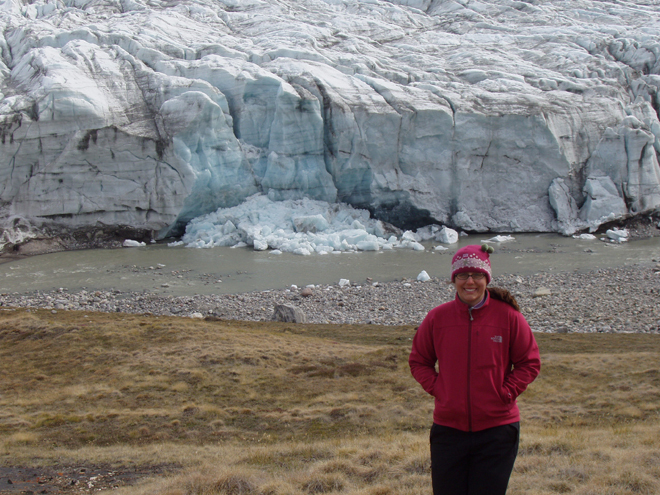 You may be asking, what is cryospheric science? Well, it is the branch of science that studies the areas of frozen water on Earth. This includes science related to snow, sea ice, ice sheets, glaciers and permafrost. 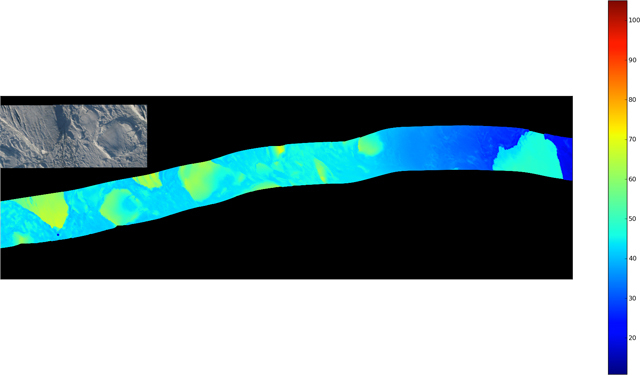 My research is focused on monitoring changes over the Greenland and Antarctic Ice Sheets and for the last five months I have been one of the NASA project scientists in charge of IceBridge. In this blog I will tell you a little about the planning that has gone on behind the scenes for this campaign. For the last five months, starting while most of the IceBridge team was still in Antarctica, NASA started planning for the Greenland 2010 Campaign. Because the austral (Southern Hemisphere) spring and boreal (Northern Hemisphere) spring are only six months apart the IceBridge team is constantly planning for the next field campaign. 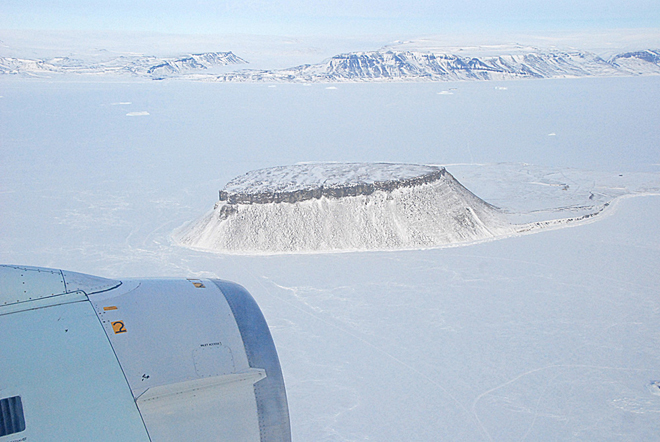 Yes, the Antarctic 2010 campaign planning has already started and the DC-8 has yet to take off for Greenland. 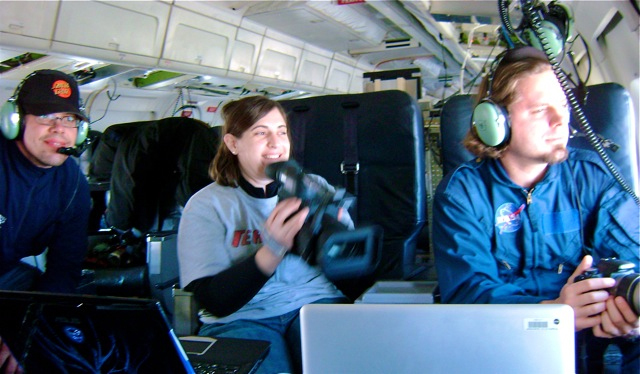 What does planning for a major NASA airborne mission entail? Two things: logistics and flight line planning. A team at NASA’s Earth Science Project Office (ESPO) and the aircraft crews have been busily working to ensure that the instruments are ready to be loaded on the plane, flight clearances are in place, hangers are ready and sufficient for the planes to use, hotel reservations are made, airports are open, divert airports are nearby in case of bad weather, cargo is shipped, the science and instruments teams have flight reservations and passports, cold weather gear is assembled, food is available, internet is set up, and the list goes on and on. These behind the scenes logistics and preparation make for a successful field campaign. 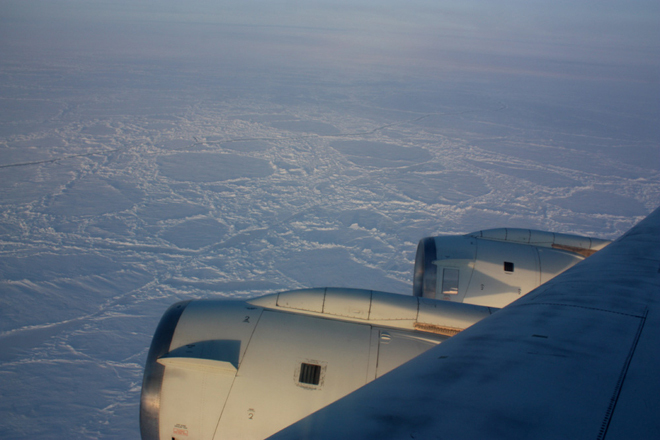 While ESPO was dealing with the logistics, the IceBridge science team and I were tasked with planning flight lines. 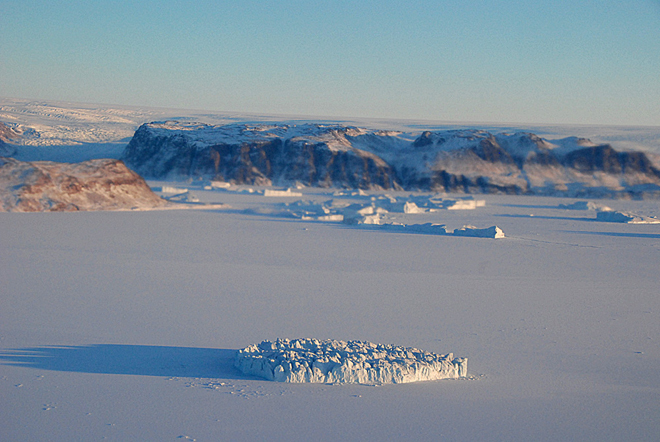 The Greenland ice sheet and the Arctic Ocean are large areas to monitor. Our aircraft cannot fly everywhere so the science community works together to decide where to fly, when to fly, and how often to fly. 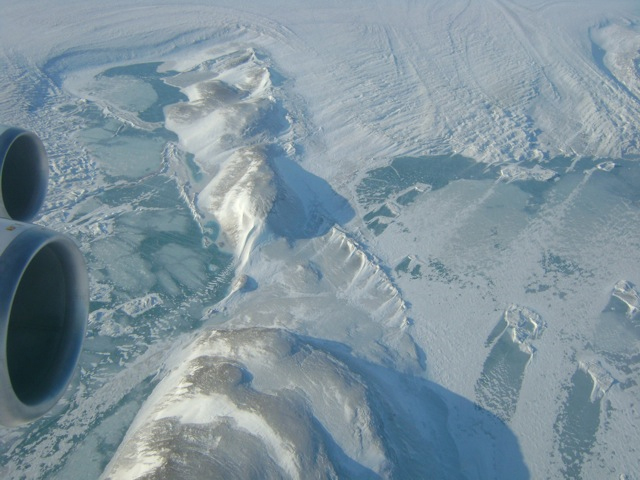 Flight decisions are made though a consensus process conducted by teleconferences and meetings with groups of scientists who specialize in studying sea ice, the Greenland ice sheet and ice sheet modeling. 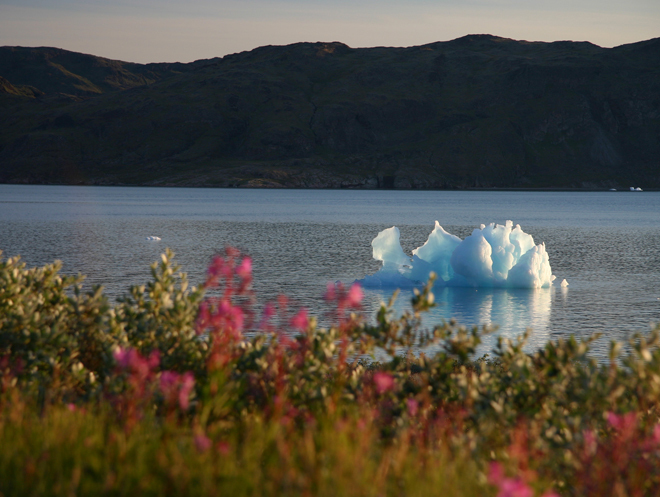 Most of the scientists are trying to answer one of the following questions: How are changes in the Greenland ice sheet affecting sea level rise? What changes are occurring to the Arctic sea ice extent and thickness? And in the future, what changes should we be preparing for as the Greenland ice sheet and Arctic sea ice cover change? Each community of scientists requests specific areas where they want data, and each community desires a specific instrument to take their measurements. In many cases there is overlap in flight lines and instruments and in some cases there is not. Throughout this campaign you will hear about specific flights and the scientific reasons they were flown. 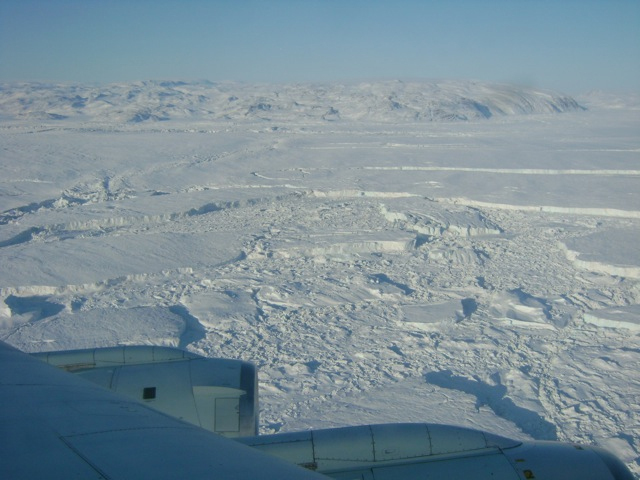 Some flights will focus on sea ice, others will overfly glaciers that are changing rapidly and some will overfly scientist working on the ground so results can be extrapolated over a larger area. 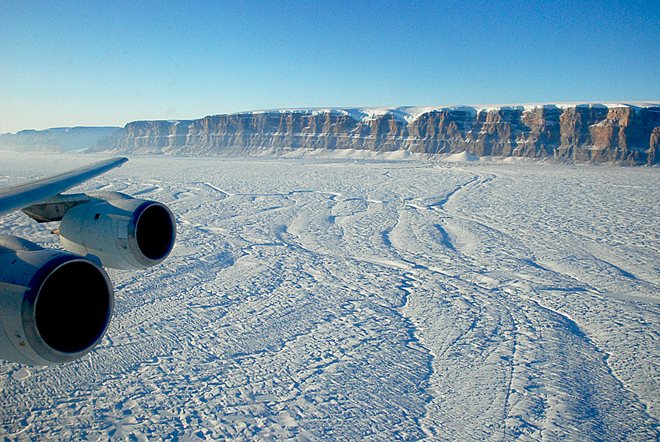 The IceBridge flight plans are designed to meet the needs of many within a limited amount of time. Flight line planning started in January and was just completed last week. John Sonntag, who you are sure to meet later in the campaign, is the master flight line designer and keeps the aircraft on track for making important scientific discoveries. Well, I hope this gives you a bit of a flavor for the work that has been occurring by computer, phone and desk to get the Greenland 2010 Campaign up and flying. Next stop Thule, Greenland, with a transit flight that — weather dependant — was designed to monitor a small portion of the southeast Alaskan glaciers and the Arctic sea ice on a transect across the Arctic Ocean. 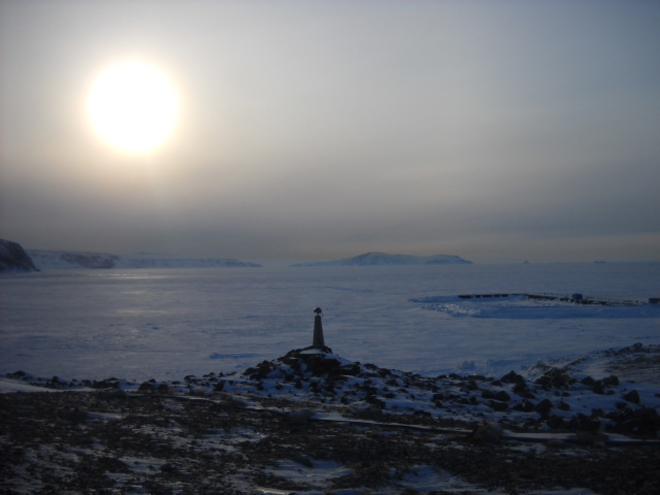 Hello and a warm welcome to all blog readers from the IceBridge team here at Thule Air Base in northern Greenland. After taking off on Sunday night from NASA Dryden’s Aircraft Operations Facility in Palmdale, Calif., the NASA DC-8 arrived at Thule Airbase on Monday afternoon. Both the aircraft and science teams have done an incredible job in setting up operations in record time here in Thule. 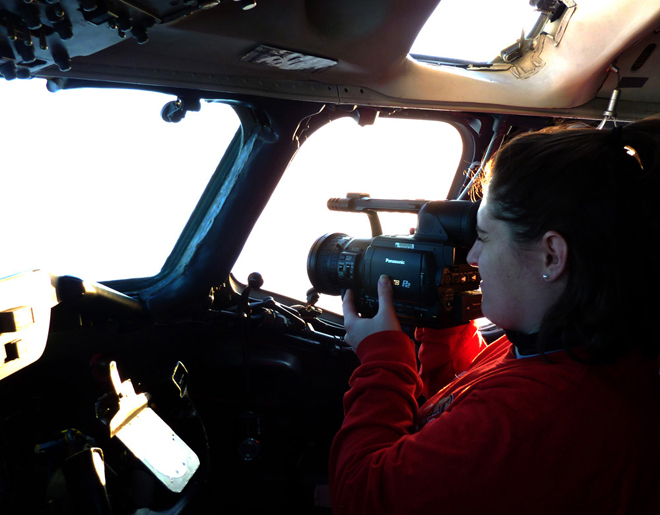 We were able to take off for an eight-hour science flight on Tuesday morning to survey the sea ice in the Arctic Ocean north of Ellesmere Island. 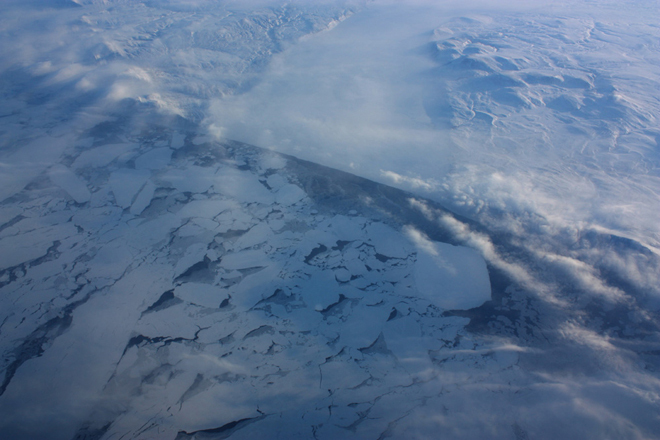 Wednesday’s science flight was targeted at several glaciers north of Thule. Some of the glaciers have been surveyed for the first time last year and we are back this year to monitor the changes that have occurred since last spring. 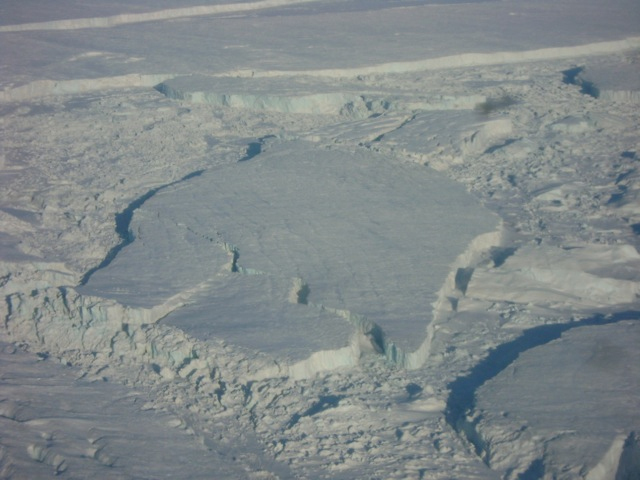 We begin the day with flying over a small glacier called Heilprin Glacier. We are very early in the season and the sun is just above the horizon in the morning hours, illuminating the coast of Greenland with its frozen fjords, icebergs and glaciers in a beautiful light. After an hour of flying we begin to fly a grid pattern in the catchment area of Petermann Glacier to measure the thickness of the ice with a radar system from the University of Kansas. These data will be used as input for computer models that will allow us to better predict how the Greenland ice sheet will respond to environmental changes in the Arctic. We continue our flight by repeating two survey lines along Petermann Glacier that have been surveyed several years before. The scenery with the steep sidewalls is spectacular. We can see huge meltwater channels on the surface that will be filled with water running down the glacier when the Arctic melt season starts in a few months. 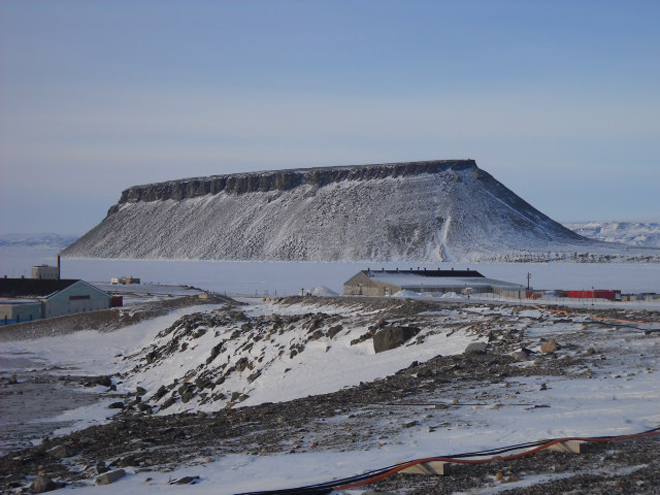 After completing the flight lines over the Petermann Glacier we turn back towards Thule Air Base and measure the ice surface elevation with a laser altimeter along a track that has been measured many times by NASA’s ICESat satellite. 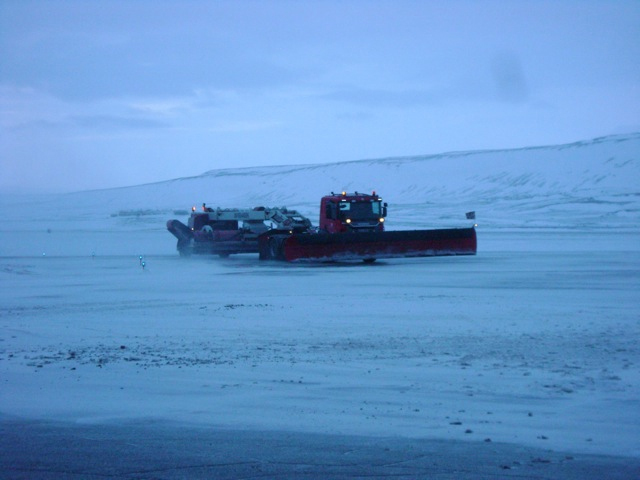 We are heading back to Thule Airbase to land before the tower and airfield close for the day. 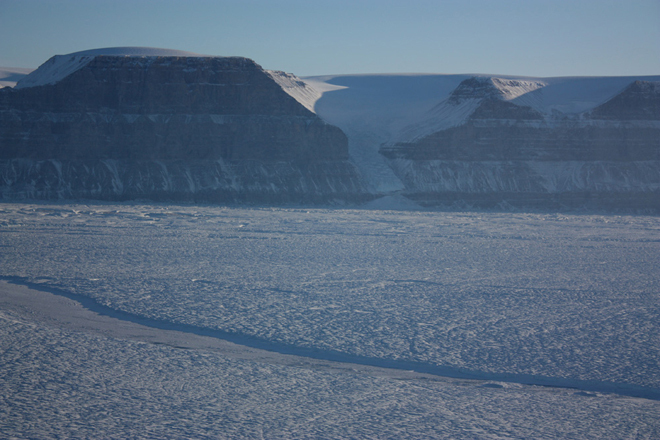 We have had an incredibly successful start of the 2010 Arctic campaign. We have been able to collect LVIS laser data along the transit from California to Greenland and have been flying 3 days in a row collecting huge amounts of data. A storm system here in Thule has forced us today to stay on the ground and everyone is catching up with sleep and data processing. With a little bit of luck we hope to fly the DC-8 again on Friday. Thanks to all the aircraft and science teams, the staff at Thule Air Base, and many people back home who have made such an incredible start of the IceBridge 2010 campaign possible!